At the beginning of every month, I dive into my site statistics program, to see which videos you guys have, and have not been watching on TheGuitarLesson.com. As you would guess, I use this info to decide what type of new lessons I should record, but in addition to that, I also create these monthly posts, where I share this information with the hope of motivating you to practice the songs others have been practicing. The result? I can definitely see, that after publishing a Top 5 lessons post, the views on the lessons listed increases. But enough rambling, let's get to it. Here are the most viewed guitar tutorials of November. Christmas is just around the corner yippie! Silent Night is probably the most popular Christmas carol of all time, so it's no wonder, that my students have started flocking to this lesson. I have no doubt in my mind, that this will be the most popular lesson of December. Spanish guitar really has it's flare. Lot's of people learn this song on my site every month. This lessons is mainly for the acoustic guitar, and withing that category, the classical guitar, since this is the guitar type which can give off that true Spanish sound. Mr. Chuch Berry is the father of rock & roll, so learning to play his songs is a must for any guitarist. You Never Can Tell is one of his greatest songs, it's actually one of the greatest songs of all time (according to several lists, search for them in Google if you don't believe me). Not so much in the Christmas spirit, but a great song nevertheless. Sampa Pa Ti is a classic song by one of the greatest guitarists of all time, Santana. If you dig the electric guitar, be sure to learn this song, as many other TheGuitarLesson.com students do every day. Drum roll please! The winner (by far) in November is a new lesson released in November, Behind Blue Eyes as performed by Limp Bizkit. This is actually a cover of a The Who song, but I think this version is better than the original. Make sure you have a go at this song, as it'll really advance your knowledge of chords and arpeggios. 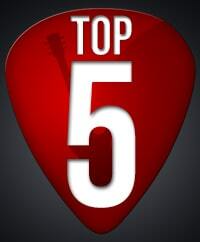 There you have it, the Top 5 most watched guitar lessons on songs from the month of November. I truly hope it inspired you to grab your guitar and learn one of the songs (or better yet, all of them). Have fun, and see you in one of the lessons!